In large bowl, mix granulated sugar, oil, vanilla and chocolate with spoon. Stir in egg product. Stir in flour, baking powder and salt. Cover and refrigerate at least 3 hours. Heat oven to 350°F.Spray cookie sheet with cooking spray. Drop dough by teaspoonfuls into powdered sugar; roll around to coat. Shape into balls. On cookie sheet, place balls about 2 inches apart. Bake 10 to 12 minutes or until almost no indentation remains when touched. Immediately remove from cookie sheet to wire rack; cool. Always a classic, these family favorites seem to have been around forever. They are delicious cookies that look great, taste great and sell like hotcakes at bake sales. 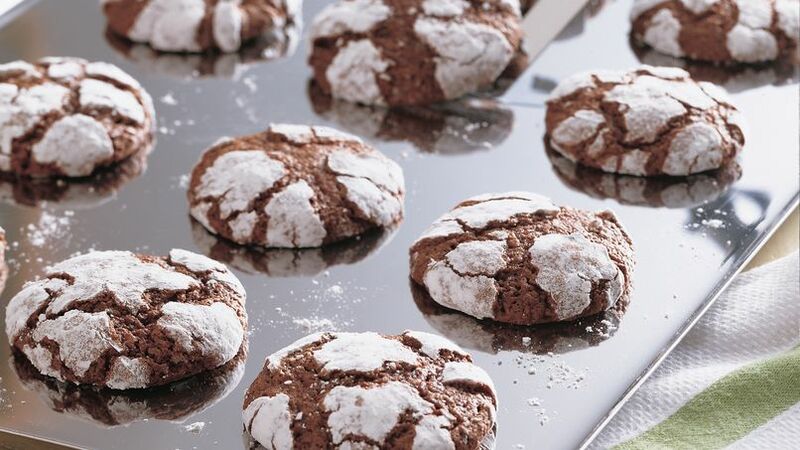 Chocolate cookies made using Gold Medal™ all-purpose flour make a delicious dessert - perfect to serve a bunch.